This is my first time participating in the weekend herb blogging, and I could not find a better herb to blog about than curry leaves! This is because it is one of the herbs that I used freshly in variety of cooking, such as my Chicken Korma. These leaves are also readily available in Malaysia. 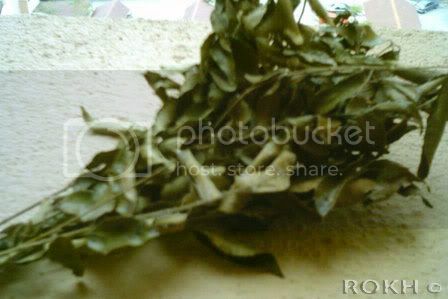 Curry leaves are featured mainly in Indian cuisines that are ubiquitous in Malaysia as the Indians are one of the three main ethnic groups in my multi-racial country. I have always been a lover of Indian cuisines, and had taken note of this unique and strong smelling herb. This special herb emits a special aroma which I believe, is hard to substitute with any other herbs. If one leaves it out in a recipe, the taste would not be quite right. Once, our local KFC even had a version of Curry Fried Chicken, where curry leaves are mixed into the batter and then deep fried with the chicken. It was certainly special where the leaves are still clearly shown on the fried chicken, but now it is off the menu as somehow, Malaysians love the long-time hot and spicy version much better. 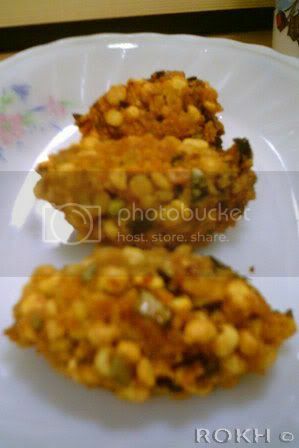 So in order to introduce this herb further, I had made vadai with it. Vadai is a type of fried gram that we in Malaysia like to snack on. It is extremely tasty with lots of flavours from the spices, a little spicy from the chillies and of course, the curry leaves. In this version that I modified from a cooking forum, KC, it includes masala in it. If masala powder is not available to you, you can make it yourself from a recipe here or any other recipes out there. Eat it out of your hands with a good lime-chilly sauce and I guaranteed it finger licking good! During shaping, I had experience difficulties in holding them together because it was too wet. I supposed it is because I did not drain the soaked dhal grams properly enough, therefore I had added a bit more flour. After that I had chilled it in the fridge while I shaped the rest of the vadais and while I heat up the oil. It did help to hold the form a little. The first batch of my vadais had gone to the trash because I had flipped it too early before it was thoroughly fried, therefore everything split. I also made a mistake by taking it out too fast, resulting in pieces of under-fried vadais. Therefore, I had timed and found that the best is to first let it fried for at least bout 5 minutes before flipping it over and then fried it for another 3 minutes to achieve the brown outlook with crunchy on the outside but soft on the inside texture. Besides, I found that one should be gentle while lowering the vadai into the oil, using a spoon and your fingers to sandwich the vadai while transferring would help. Soak both ground and whole dhal gram in separate bowls for 5 hours. Drain both bowls of dhal gram and mixed into a large mixing bowl. Add the rest of ingredients. Wet your hands and shape them into patties.